Route 32 Auctions will hold their inaugural Gas & Advertising Show on Friday, June 8th, followed the next day by a Grand Opening Auction. Both events will be held in the new auction facility located at 3097 East State Rd. in Crawfordsville, Ind. 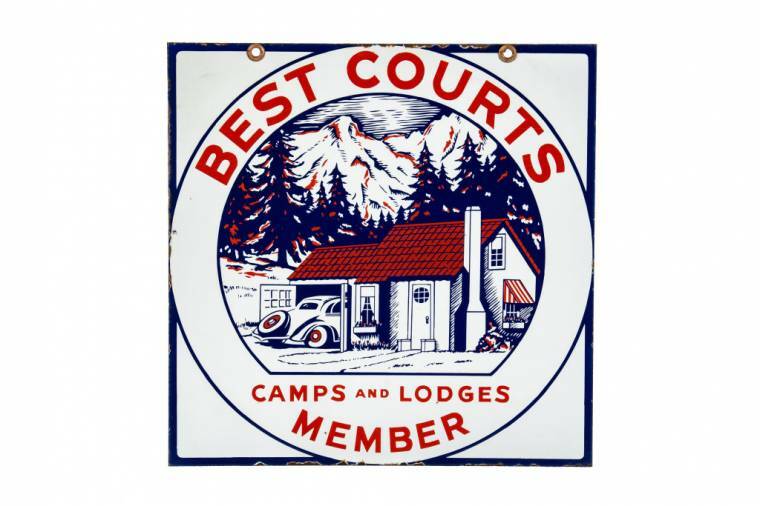 Very rare double-sided porcelain sign for Best Courts "Member" Camps and Lodges. CRAWFORDSVILLE, Ind. - May 28, 2018 - PRLog -- Route 32 Auctions will hold their inaugural Gas & Advertising Show on Friday, June 8th, followed the next day June 9th, by their Grand Opening Auction. Both events will be held in the new auction facility located at 3097 East State Rd. 32 in Crawfordsville (https://maps.google.com/?q=3097+East+State+Rd.+32+in+Crawfordsville&entry=gmail&source=g). The auction catalog is currently available online, at Route32auctions.hibid.com and on the bidding platform Proxibid.com. Phone and absentee bids will also be taken. The preferred hotel is the Hampton Inn in Crawfordsville. For reservations call (855) 516-1090 (tel:(855)%20516-1090). Crawfordsville is located approximately 35 miles northwest of Indianapolis, Indiana's largest city. The first annual Gas & Advertising Show will be held from 6 am to 4 pm Eastern time and will feature a large variety of vintage advertising vendors. Doors for the June 9th auction will open at 8 am Eastern. Uncataloged items will start the auction at 9 am, followed immediately by the cataloged portion at 10. The auction will feature approximately 450 lots ranging from porcelain signs to motor oil cans and everything in between. "This auction will feature some great pieces that are seldom seen at auction and rarely available for sale," said Joe Canchola of Route 32 Auctions, which held its inaugural auction in November. As in that auction, all lots in the June 9th auction will be sold to the highest bidder at no reserve. Three featured lots in particular that are expected to attract major attention because of their condition, rarity, and subject matter. The first is a very rare double-sided porcelain sign for Best Courts "Member" Camps and Lodges, boasting excellent color and gloss. The sign measures approximately 24"x24" with a great scenic mountain scene. This sign is a true investment quality piece and very few are known to exist.The second is a Mother Penn Motor Oil double-sided porcelain curb sign, marked "Textile Inc.," and measuring 20.25"x30". The sign has above average color and gloss and displays well. The third is a single-sided porcelain sign for H.P. Hood & Sons Milk with a wonderful cow graphic and marked "Burdick Enamel Sign Co., Boston Mass." The sign is 28 ¼ inches in diameter. Automotive dealership signs are a big hit with collectors, and this auction has some nice ones. They include a Studebaker double-sided porcelain sign boasting good color and gloss, and a Cadillac "Authorized Service" double-sided porcelain sign, marked "Walker & Co." (Detroit). Petroliana encompasses more than just porcelain signs. A good example is the pair of Johnson "Gasolene" 15" lenses housed in a metal body. The lenses show strong color with the rare hourglass logo and the globe measures 19.25" tall. Coca-Cola collectibles have a huge and loyal following. Examples in the auction will include a "Drink Coca-Cola" Colonial double-sided porcelain sign, 49.5"x57", marked "Made in USA 1941" and retaining all four of the diecut bottles that remain affixed to the sign; a "Drink Coca-Cola" ("Fountain Service") single-sided porcelain sign, 54.25"x96.25" and made by the Tennessee Enamel Mfg. Co. (Nashville), marked "Made in the USA 1933"; and a Coca-Cola drive-in theater double-sided porcelain entrance sign, 49"61.25". Ever heard of a soda called Croce's? Probably not, and that's why bidders are expected to flock to the single-sided porcelain sign with early graphics for the beverage which measures 46"x29.75" and is believed to be the best example known is in existence. Also up for bid will be a "Buy Merita Bread" single-sided tin sign with Lone Ranger and embossed bread loaf graphics, measuring 38"x25 ½"and marked "A-M Sign Company" (Lynchburg, Va.) and dated December 1955. Back to petroliana, with a Woco-Pep "King of Motor Fuel" double-sided porcelain sign showing excellent color and gloss, marked "Burdick" (Chicago) and measuring 41.5"; and a 36"x59.75" Power-Lube Motor Oil double-sided porcelain sign, the rare large variation. Other noteworthy motor oil signs include an Oilzum Motor Oil double-sided tin hanging sign with above average color and gloss, measuring 19 ¾ inches by 30.75" and marked "A-M 10-50"; and an Oak Motor Oil double-sided porcelain curb sign measuring 21.25". For tire sign enthusiasts, the sale features a horizontal Michelin Tire double-sided porcelain sign with Bibendum graphic, 30"x60" and marked "Beaver Enamel Co. Ellwood City, Pa."; and a Hood Tire Dealer curved diecut single-sided porcelain sign, 35.5"x11.5". A Husky figural topped double-sided porcelain sign depicting the iconic Husky dog logo and consisting of eight porcelain panels in total (three upper and one lower on each side) appears never to have been taken apart and retains its original 56.75"x72.5" frame. The sign is marked "Texlite, Inc". Also for bid is a Weed Chains Gasoline Pricer (for car tire chains) single-sided tin sign with early car graphics, marked "The American Art Works, Inc., Coshocton, Oh." Rounding out a few more of the day's expected top lots are a Sweet-Orr "Union Made Clothes" double-sided porcelain sign measuring 39.75"x32"; and a rare John Deere single-sided porcelain three-legged sign measuring 24"x72" and marked "Veribrite Signs" (Chicago). Route 32 Auctions specializes in petroliana, automobilia and general store memorabilia. The firm is always seeking quality consignments for future auctions. To inquire about consigning a single item or an entire collection, you may call them at (765) 307-7119 (tel:(765)%20307-7119); or, you can send an e-mail to info@route32auctions.com. For more information, visit www.route32auctions.com.